Justin wanted to sleep in this morning, but the music that comes over the intercom for the 6:45 wake up call just wouldn't stop, so he got up and ate breakfast after all. 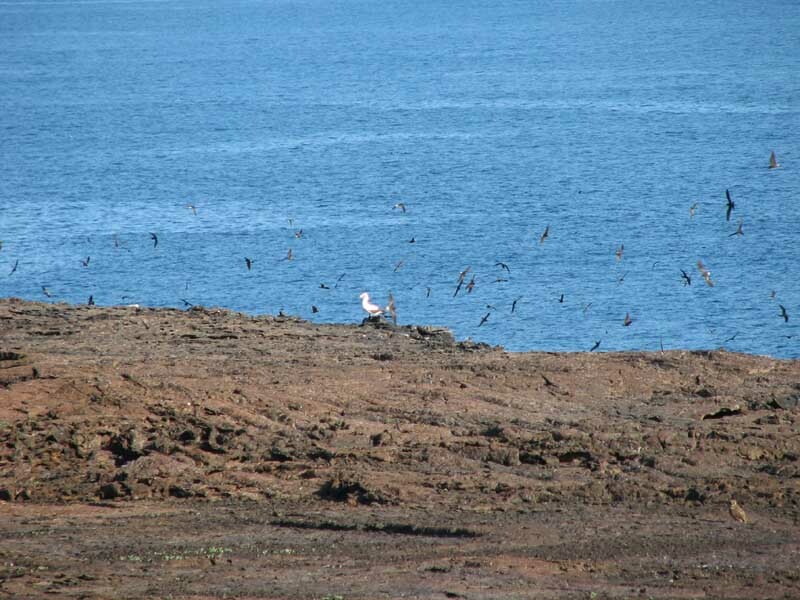 After breakfast, the morning excursion was to Genovesa (Tower) island, where there are tons of birds. Upon landing, we saw lots of frigate birds, red-footed boobies, and sea lions. 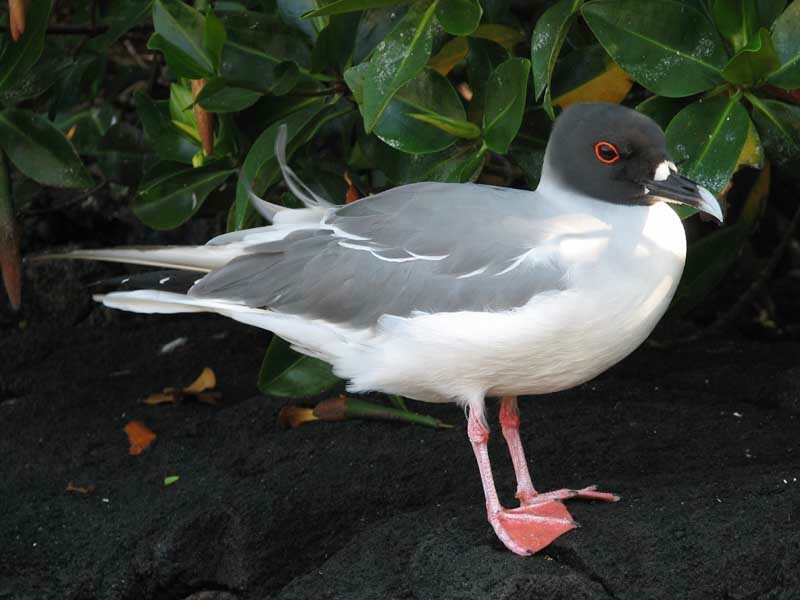 On our walk, we saw many more frigate birds and red-footed boobies, along with swallow-tailed gulls (the birds that had flown alongside the night before), lava gulls, yellow-crowned night herons, mockingbirds, Nazca (masked) boobies, and even an ani. 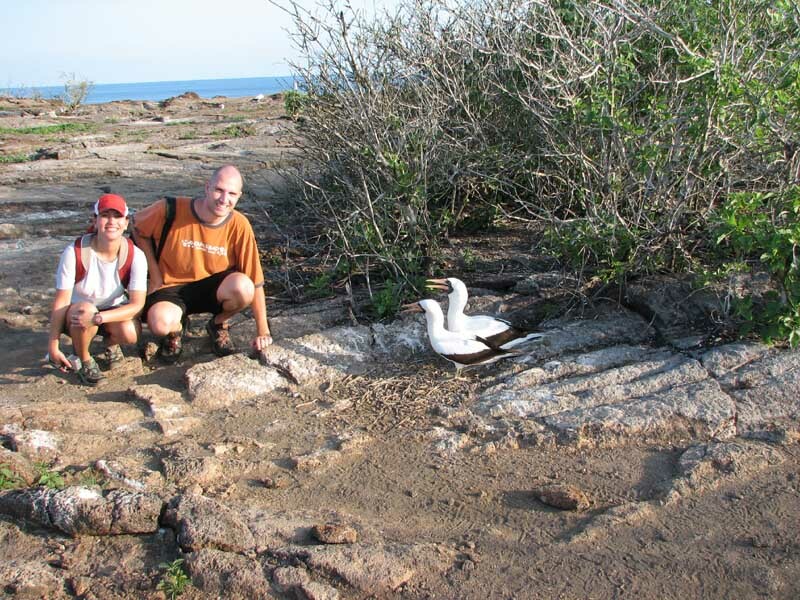 Our guide, Elizabeth, wrote down that she saw an ani, because she had not heard of one being on Tower Island before. 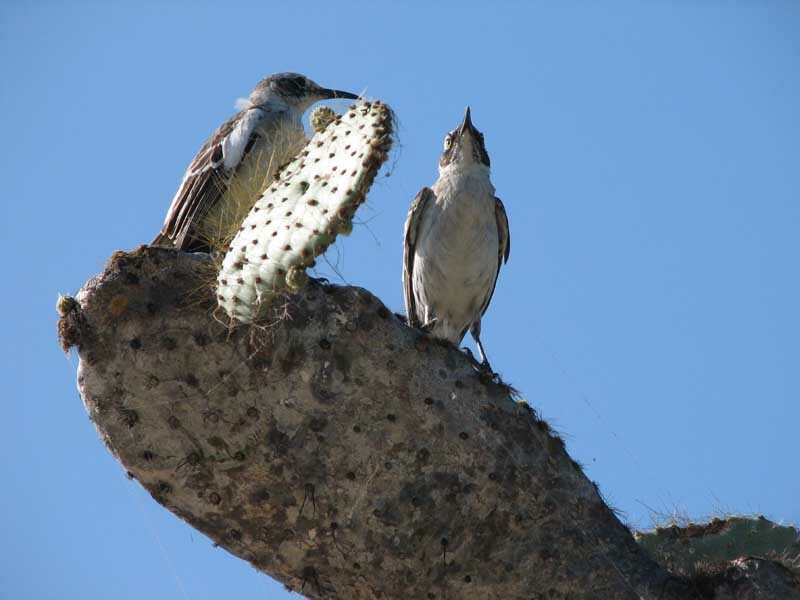 Anis eat the eggs of other birds, and compete with a lot of the endemic species, so the people at the National Park try to eradicate the anis. Also along the walk we came across several small ponds that are connected to the ocean by underground tunnels. 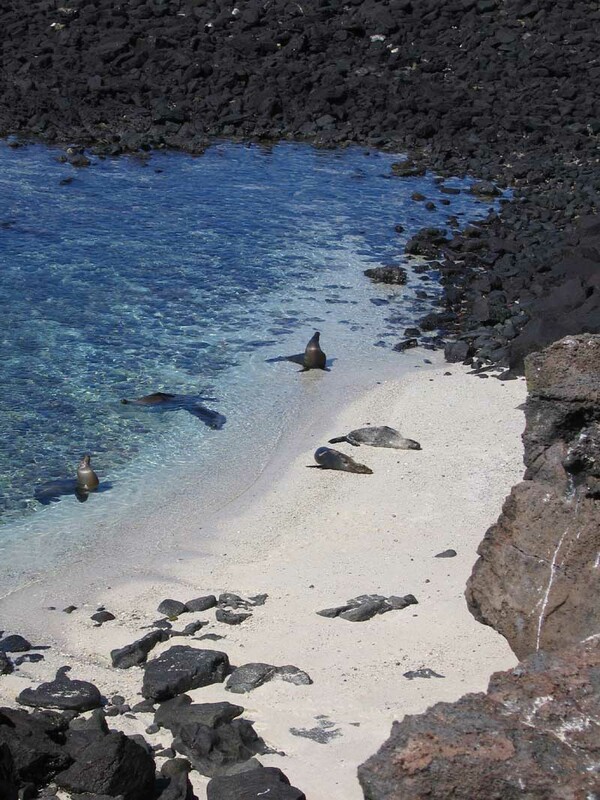 We also saw a very big Galapagos shark in the water – Elizabeth estimated it was 8-9 feet long. We were told that in a few months large boats will no longer be allowed to come to Tower island. 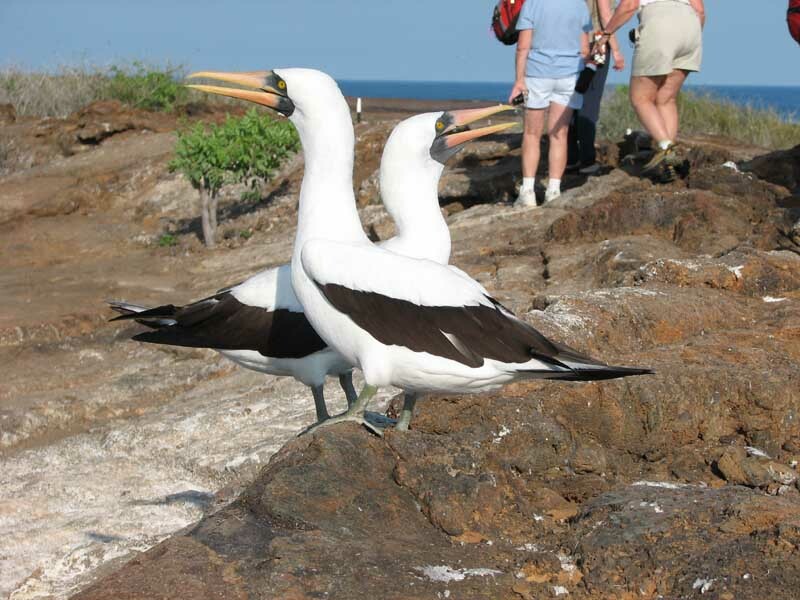 This will be a big loss for the Eclipse, because Tower island has by far the highest density of birds in the Galapagos, especially frigate birds and red-footed boobies. We came back from Tower to the boat for about 10 minutes, then went out snorkeling. 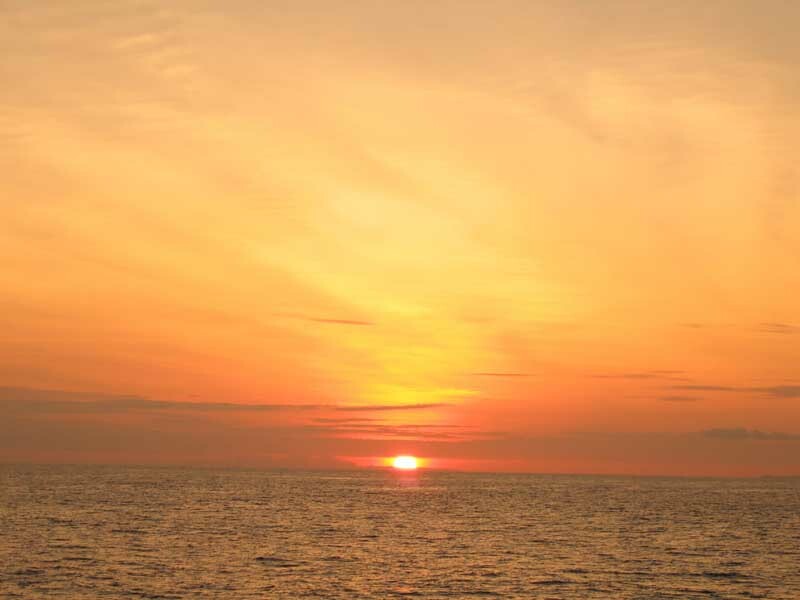 The panga took us to a spot just off Darwin Bay . We saw a manta ray, some small sharks (not the large one we had seen from land), some parrot fish, some yellow-tailed sturgeons, and a bunch of other fish we can't identify. We also saw two bull sea lions chasing after one another. Back on the boat, we cleaned up then had a "Mexican food" lunch. For everyone not from California , they probably didn't know any better. We set our expectations too high, but it was still fine. Crystal had a Margarita and Justin had a Tequila Sunrise. Justin also impressed the people at his table with his burrito-rolling skills. They were all from Great Britain , and had no idea how to eat their burritos. Justin told them that he lived less than an hour from the border, and that it was no big thing. He spent a good deal of the meal talking with one couple about their garden. They kept asking him for questions about their landscape design, but almost all of his knowledge is about plants that grow in areas where it rarely or ever freezes, and they were looking for a bunch of plants that could easily take freezing temperatures. After lunch we took a siesta before the afternoon excursion. 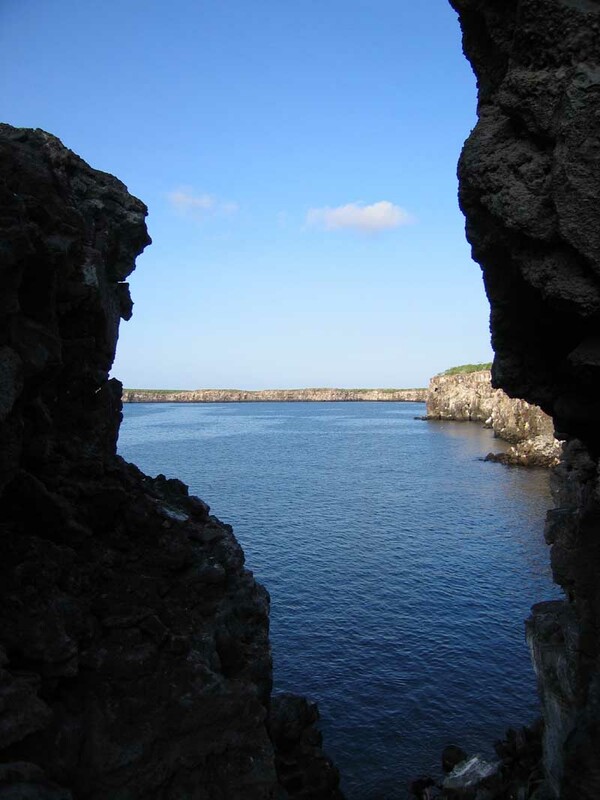 The afternoon excursion was, for us, a hike on the other side of Tower island. Only about 25% of the boat went on the hike. 50% just went snorkeling again, and 25% did neither, simply going around the island in a panga. Those who didn't go on the excursion really missed out – there were birds everywhere. 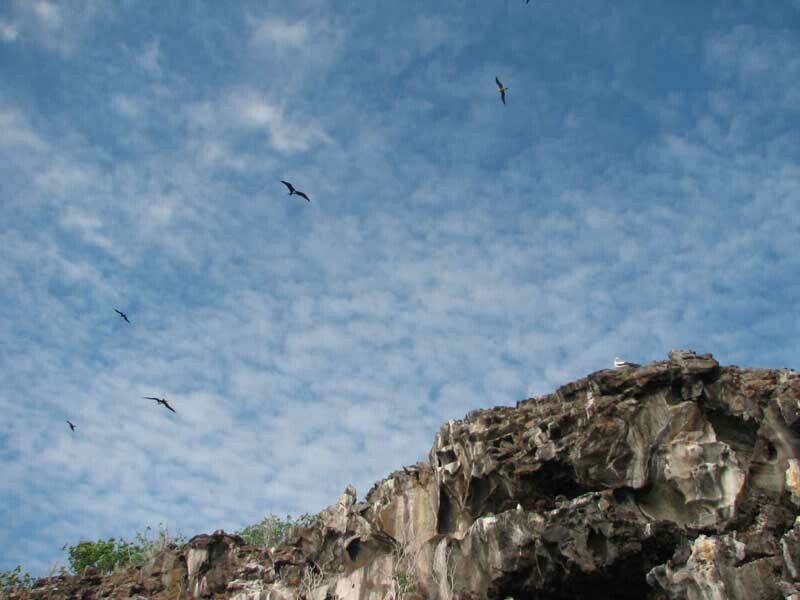 On the panga ride from the Eclipse to our landing, we saw lots of frigate birds and tropic birds flying overhead. 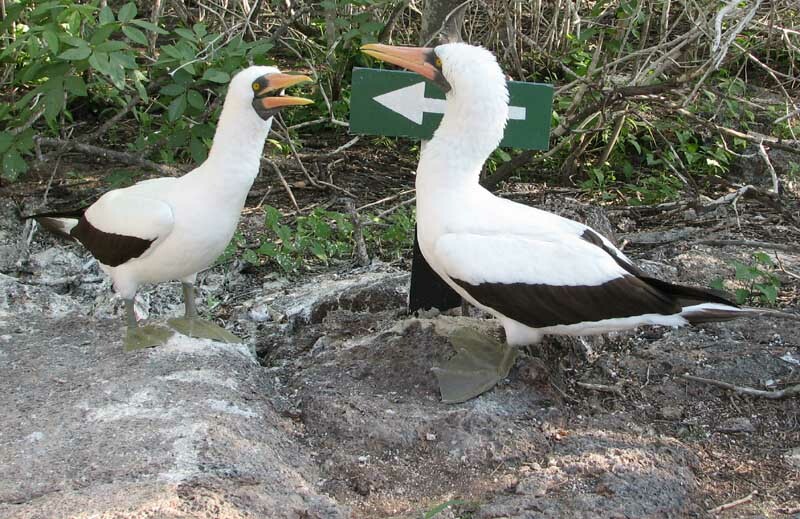 The tropic birds catch fish, and then the frigate birds try to take them. Frigate birds are pirates – they take food from other birds by maneuvering around them in the sky and snatching food out of the mouth or pecking until the other birds regurgitates its food. 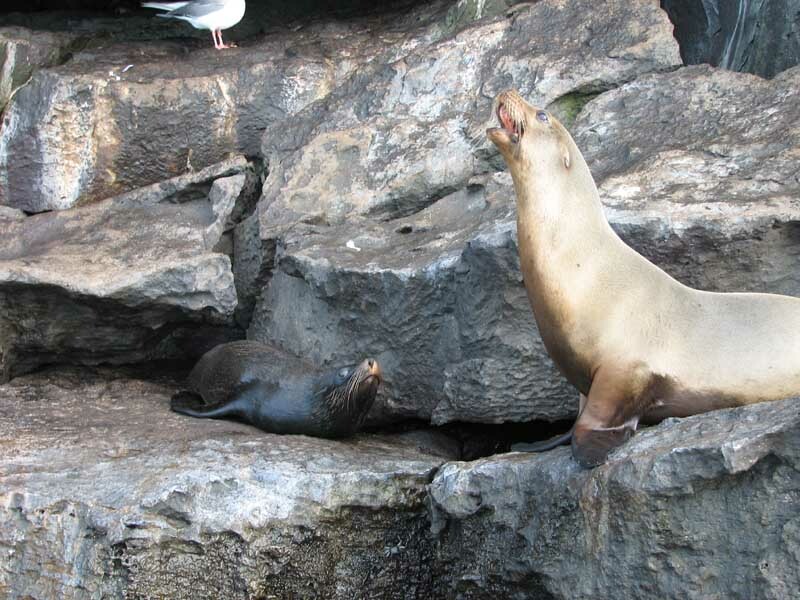 We also saw some fur sea lions and some Galapagos sea lions, and in fact saw some side-by-side. 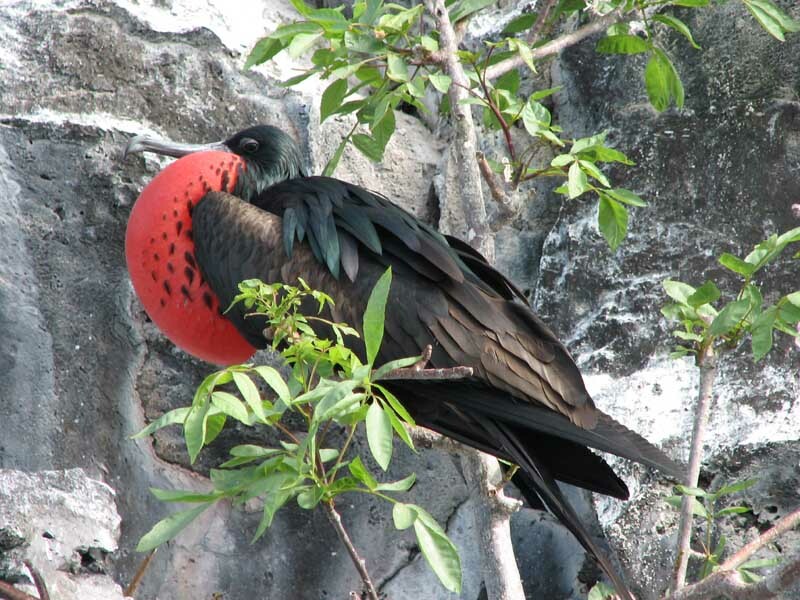 Right near where we landed there were several frigate birds hoping to mate, red throats fully inflated. 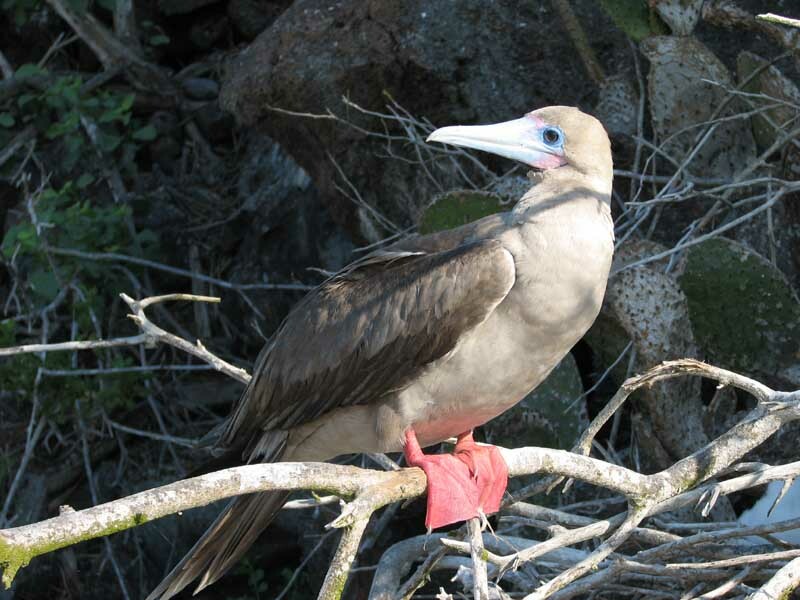 There were more red-footed boobies, including some of the white variety (brown is the norm). There were also several tropic birds, hundreds of Nazca boobies, and 2 owls, including one that we saw flying. The short-eared owls feed on the petrels, sitting camouflaged on the rocks until a petrel flies too close and becomes a meal. We were at the back of the group, and a couple of us (including the two of us) saw one of the owls fly right by us, with a new kill in mouth. We had to adjust our hike to avoid the Nazca boobies – there were so many of them they kept walking right in front of us as we walked down the trail. A couple times we almost stepped on them. One couple let us pose with them. We had a nice dinner with Margo & Chuck and John & Phillip. Margo & Chuck, who live in Tucson , told us their story of how they got married. They were childhood friends, but then each got married and moved apart. After they both got divorced almost 25 years later, they met again and got married. John & Phillip live in Boston now – they just moved from San Francisco . The six of us closed the place down. It was the best company we've had all trip.